Bell and Holmes twist and wind back to where they started while we get to see Watson's mob fetish. Not the most exciting episode, but glad the drama is out of the way and gang's all back together. Jeff Neumann /CBS ©2013 CBS Broadcasting, Inc. 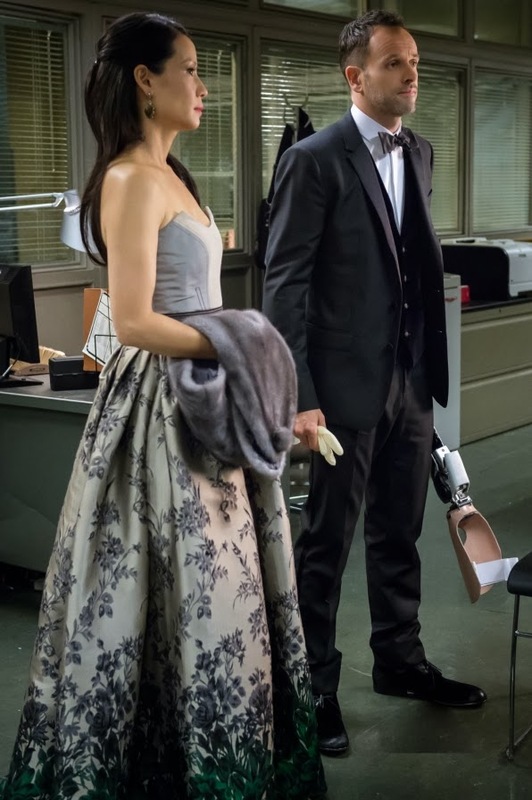 Elementary "All in the Family" (S02E13): Starting with Holmes and Watson in formal evening wear requesting a man's leg, Detective Nash kicks them out after they identify the hidden compartment in it that the individual was using to steal museum items. Apparently, the duo hasn't been getting along with any detectives after Bell left for his new job in the intelligence department. He no longer carries a gun but gets assigned field work so he's happy. Investigating a tip about a suspicious barrel at an oil recycling place, Bell finds a barrel with a body in it. He calls in Gregson who shows up with the duo. He and Gregson catch up like old friends but it's still awkward between Bell and Holmes. After investigating the headless and handless body, Watson identifies it as Handsome Bobby, a mob guy. Apparently Watson has a degree in mob history and workings from growing up in Queens. They call the deceased's father to identify the body, and he admits he hasn't seen his son in a few months. Holmes goes to find out more about the tip received by Bell's new department. Holmes lands a job from the department head and Bell takes issue with him being around. Later that night, as Holmes is trying to replicate the process used to remove the head of Handsome Bobby, Watson identifies a possible suspect in a rival family. The next day, the duo head to rummage through the suspect's garbage, but get turned away right before the suspect dies in a car explosion. Holmes finds a piece of Handsome Bobby's skull in the dead mobster's kitchen. He also discovers NSA documents containing copies of coded emails from Handsome Bobby's rivals. The duo crash a fake business that's an NSA front, but don't get anyone to acknowledge that they're NSA. Bell heads to the police station to convince Gregson not to let Holmes work in the intelligence department. Meanwhile, Holmes is conducting bombing experiments using the chemical Tovex, as Watson grills Holmes about taking work in Bell's department just to mess with him. Holmes receives an encoded text message from the NSA and learns that Bell's new boss, deputy police commissioner Da Silva, is the one who requested that Handsome Bobby be found, making him dirty and working for a mob family. The duo decide to go after him, the 4th-highest ranking police official in New York, and enlist Bell's help. Bell resists and has a first-class argument with Holmes before leaving. He has second thoughts though, and finds a ton of evidence in Da Silva's office about mob dealings.